People using assistive technologies need to be able to navigate through form fields and elements (checkboxes, for example) in the correct order. In addition, a textual description of each field or element is required so that users can properly access or input the form information. While forms are not generally created using PowerPoint, the Purpose of this checkpoint is to ensure that electronic forms created in MS PowerPoint are accessible when converted to PDF. CommonLook Office GlobalAccess will convert ActiveX controls to accessible form-fields in the generated PDF file. Note: Although Content controls can be used, CommonLook Office GlobalAccess will flatten the data in them and that data will be provided as regular text. Content controls will not be converted to electronically fillable form fields (or elements) in the generated PDF. Form fields will be converted to PDF in the tab order specified in the Logical Reading Order checkpoint. The tab order between fields will be set to follow the logical structure of the presentation. The “Help Text” will be converted to a tooltip. Radio button groups will be converted to mutually exclusive checkboxes that have the appearance of radio buttons (actual radio button controls are inherently inaccessible). When CommonLook Office GlobalAccess detects form fields or elements in the presentation, they will be listed in the panel for this checkpoint. Help Text: This text needs to be manually entered into the CommonLook Office GlobalAccess panel in PowerPoint and it becomes the “tooltip” read by assistive technology in the PDF when the user lands on the field (the field ‘gets focus’). If Help Text is not provided, an error will be displayed and the user will be reminded to provide the necessary text. Width: The width of the field in the specified units (refer to the “Width type” option below). CommonLook Office defaults this value based on the location of the field in the slide to maximize the field’s size when converted to PDF. For example, if the field is in a table cell, CommonLook Office will size its width so that it takes up all the available space in the cell. This is because fields in PowerPoint may allow entry of data beyond what would fit in the width of the field (provided that the Maximum Text Length allows it). The PDF format, on the other hand, limits the data entry to what would fit within the width of the field. Reset – the button will clear the PDF form. Print – the button will print the PDF form. Submit – the button will submit the form. If this option is chosen then the “Submit type” options become enabled. Refer to that item below. 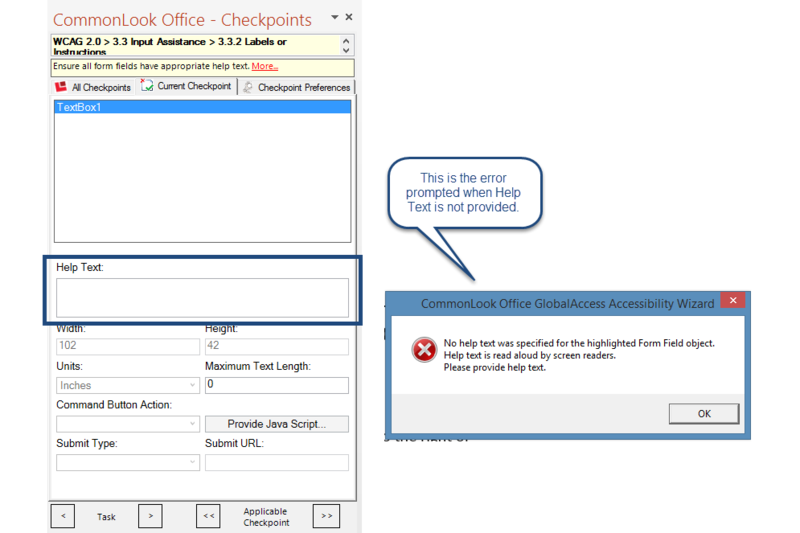 Custom Script – If selected, the “Provide Java Script” button in the CommonLook Office GlobalAccess interface becomes enabled. Provide Java Script: If a Command Button has been used in the presentation, and the “Action” is “Custom Script, a window will open here for the author to provide the necessary Java Script. Important Note: Java Scripts must also conform to accessibility guidelines. CommonLook Office GlobalAccess will notify the user that Java Script has been implemented in the presentation. The code, however, will be deployed as-is and will not be checked for correct syntax or accessibility. Submit Type: There are four available “Submit Types” – HTML, PDF, FDF, and XFDF. Please refer to PDF specifications for more information on the various submit types. Submit URL: If the form is to be submitted online, this field allows the author to input the url to which the form should be submitted. The screen shot below shows the CommonLook Office GlobalAccess panel for the Forms checkpoint as described above. Shown next to the checkpoint panel is the error message that is displayed when a form element does not have Help Text assigned to it. A note regarding Annotation Types (PDF U/A): CommonLook Office GlobalAccess only creates widget (form) annotations and link annotations. This checkpoint is otherwise not applicable in CommonLook Office Global Access.